Finally! The clean look of a custom SEG extrusion display with the portable features of a pop up display! The new Embrace SEG Hop Up Display has combined the best features of three display systems to create this innovative design. The key to this display is Silicon Edge Graphic finishing(SEG) that inserts into channel bars around the perimeter of the frame. 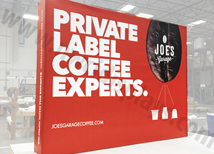 Which creates a graphic with NO exposed finishing, no Velcro, no individual panels, no magnets, no lining up panels, or extreme stretching in the corners. 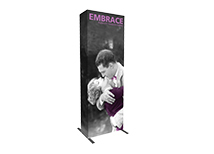 The Embrace Hop Up offers all the features of portable pop up displays with the look of a custom display. It includes an accordion-style Hop Up frame that pops up quickly. After assembling the frame install the channel bars and install the graphic. 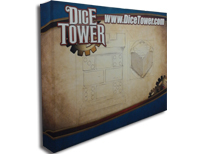 Set up time should be around 20-30 minutes for the average person and when you are done you will have display that stands out from every other pop up display! Embrace 10'w x 8'h SEG Display - Seamless Push Fit Graphics! 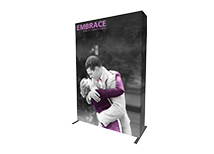 BACKLIT Embrace 10'w x 8'h SEG Display - Seamless Push Fit Graphics! Embrace 20'w x 8'h SEG Display - Seamless Push Fit Graphics! Embrace 30'w x 8'h SEG Display - Seamless Push Fit Graphics! Embrace Inline U & L Shaped SEG Display - Seamless Push Fit Graphics! 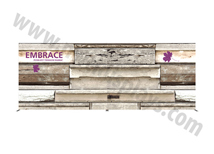 Embrace 8'w x 8'h SEG Display - Seamless Push Fit Graphics! 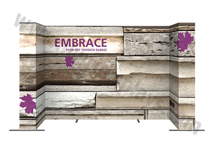 Embrace 2.5'w x 8'h SEG Display - Seamless Push Fit Graphics! 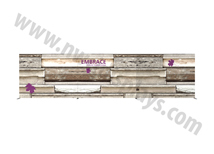 Embrace 5'w x 8'h SEG Display - Seamless Push Fit Graphics!